LOVELY LITTLE LADY Lovely Julie Bishop of Warner Brothers, doesn't lower page one cheesecake standards any. You can't say as much for the accompanying caption material, which ironically advises that this is how to look pretty when HE comes home on leave. NEWCOMER Last week, the Roundup announced that Maj. Gen. George Stratemeyer had been relieved as Chief of Staff of the Army Air Forces to accept an "undisclosed assignment of extreme importance." His assignment in the Theater will be revealed soon. Twenty survivors of an A.T.C. plane crash who participated in a dramatic mass parachute to safety today awaited arrival of a rescue party which should by now be not far away. Presence aboard of three important civilians focuses additional attention to the accident, caused by a mechanical failure. They are John Davies, Jr., the State Department liaison officer with Lt. Gen. Joseph W. Stilwell's headquarters, Eric Sevareid, well-known commentator for the Columbia Broadcasting System and William T. Stanton, of the Board of Economic Warfare. Davies, Sevareid, Stanton and 14 other passengers are safe at a small village a short distance from their leap to safety, along with three members of the crew. One member of the party, who for three days had been reported as missing, made his way to the village uninjured. Information is now being given to planes flying over the area. Lt. Col. Donald C. Flicklinger, A.T.C. Flight Surgeon, who parachuted to the party with two enlisted men volunteers, reports that the party is well. One of the parachutists was injured, but Flicklinger has announced he is mending rapidly. Food, medical supplies, tents, mosquito nets, cigarettes and gifts of cloth and trinkets for the villagers have been parachuted to the party. First inkling of the crash came when the base from which the plane took off, China-bound, received a radio message from the pilot that he had given orders to the occupants to bail out and signaled his approximate location. The plane that discovered the party making its way to the village was piloted by Capts. Hugh E. Wild and George Katzman. Food and medical supplies were immediately dropped. Wild and Katzman returned with Flicklinger, who, when he received the signal, "Send medical man with rescue mission," prepared to jump. He had been given advance permission to bail out if it was apparent that those on the ground needed medical aid and if it appeared as if a ground expedition could not reach them quickly. The jungle in the area where they landed is anything but healthy and the presence of a medical officer was considered essential if survivors were to stay there longer than a day or two. Sgt. William G. McKenzie and Cpl. Richard S. Passey, who had never jumped before, volunteered to accompany Flicklinger, DFC holder, who leaped voluntarily before while serving in the Philippines. Later, Wild and Katzman returned in separate planes. Katzman could not locate the party because of overcast, but Wild came in "on the beam" and dropped items necessary for its well-being. Meanwhile, the ground expedition is en route to the party and its three voluntary members through tangled, pathless jungle country. Combat crews of the 10th Air Force were up there trying all last week. But what can one do when solid fronts extend from zero to 30,000 feet? Ceilings could be measured only with calipers on all seven days but, nonetheless, bombers went groping through the nimbus three days. They waited for openings the size of a camera shutter to spot targets. By the time bombs were away, clouds generally closed in. Mildew and dripping green mold accumulated on the fighters all week. August 3 was the busiest day of the week. 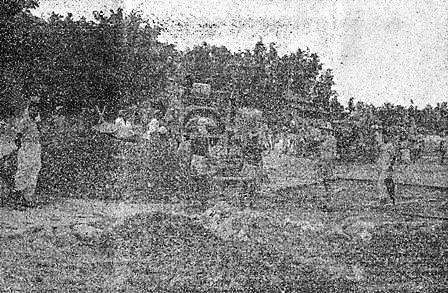 Heavies pushed through to Thanbyuzayat where they smacked the installations and supplies accumulated for the railroad extension to Siam. Other B-24's cratered the runway of the Jap landing grounds at Pagoda Point, then strafed buildings in the area. Medium bombers, meanwhile, were at work over central Burma. At Wetlet, rolling stock, tracks and supply dumps were blasted. At Moksogyon, railroad facilities were damaged. At Kinu, bursts were seen among freight cars and storage buildings. Two violent explosions and many fires were reported. Other mediums made low-level attacks on the railroad station at Thazi where hots were reported, and on the reservoir dam at Meiktila. It was in the latter operation that a bomber was lost. August 7, the mediums hit widely separated targets. Railroad installations at Ywataung, Paukkan and river shipping all were bombed. Hits or near hits seen at Thazi dam before the clouds blotted out the scene. Hits were reported on tracks and freight cars at Aungtha and between Samon and Thabyedang. The ports of Bhamo and Katha on the upper Irrawaddy were targets for the B-25's on August 9. Direct hits were seen on rolling stock and among dock storage facilities at Katha. Fires were left burning in the warehouse area at Bhamo. 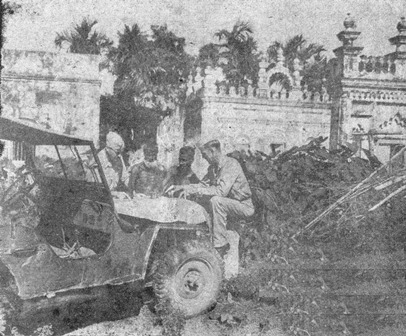 Lt. Col. Raymond Wiseheart and Lt. Ernst discuss with two Indian workers why a temple must be raised to build the air service base. Cpl. 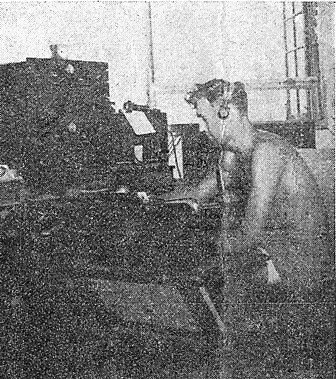 Rufus Warren is the radio receiving and sending operator in the control tower of the base. 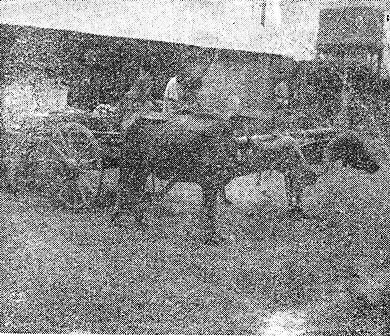 Mess Sergeant Electo Schexnider receives the daily supply of fruits and vegetable brought in by coolies by ox cart. Signal repair men are busy stringing communication lines for the new air service base. Sgt. Anthony Guzio checks to see whether anyone has consorted with a malarial mosquito. He stepped in when the medical officer became ill.
Mohd Din gives Sgt. Frank Skufcu a haircut, Indian-style. There's no conversation about baseball and politics. Construction of one of the taxi-ways is in progress under the supervision of S/Sgt. Owen R. Miller. The main runway is already in use by U.S. planes, although not "officially" completed. From China today comes a delayed but graphic word picture by Darrell Berrigan, United Press correspondent, of the 14th Air Force's raid upon Hankow Airdrome July 26 and the accompanying air scrap in which B-25 gunners and P-40 pilots knocked down 13 defending Zeros of a swarm of 40. "The Mitchells' bombs tore holes in Hankow airdrome's runways, fragmentation bombs scattered widely over dispersal areas and other bombs wrecked airport buildings. Throughout the run, Zeros, greatly outnumbering the P-40 umbrella, swarmed around the bombers so fast the gunners were never able to look down to confirm their shots. "Sgt. Charles Patton, Duncanville, Tex., the top-turret gunner in Capt. Lloyd Murphy's command plane, destroyed three Zeros and almost certainly destroyed several others. "'I glanced up,' said Patton, 'and saw a Zero diving for our formation with five more following him. I threw my guns almost straight up and pulled the trigger every time one peeled off. They were coming so fast I couldn't tell whether I got any of those. "'Then nine Zeros came out of the sun. I kept firing. At the same time, Zeros came from the rear, above and below us. I couldn't tell whether I was hitting them or not. Then a Zero peeled off and banked and I got a burst into him. He went down smoking. Later the Zeros made a frontal attack and seemed to be flying right into the cockpit. I got my tracers squarely into the right engine of one of those. I shot at five or six more planes, but they disappeared too fast for me to see what damage I was doing. Toward the end one came in from the left and I shot into him. Our bombardier saw him fall." "Another gunner in the formation, Sgt. M. R. Galuzzo, destroyed two Zeros for certain. "All the bombers returned safely, only one carrying a single bullet hole. "Meanwhile, Capt. Elmer Richardson, San Antonio, Tex., led the small force of P-40's into the fight. He destroyed two Zeros which fell flaming, making him an ace with a total of six victories. "Lts. Lynn Jones, Chris Barrett and Donald Grover destroyed one Zero each." SO YOU DON'T LIKE OUR CHEESECAKE? You who are unappreciative of the Roundup's page one cheesecake cast your peepers on three pictures we could have used. Strictly unshucked corn huh? The piquant miss, left, undoubtedly represents a female member of the Georgia chain gang. We can't understand any reason for the red flannels encasing the gal in the middle panel, unless they show her figure to better advantage. As for the press agent's gag, right, well . . .
ASSAM STATION HOSPITAL - Inasmuch as the rest of the boys are sounding off about their respective organizations, we thought that perhaps you would like to have a few lines from us. That is, if some of you haven't already heard the weird strains of Oklahoma Ike floating through the steam-heated air of Upper Assam. For your edification, this song is the favorite of all the boys in this hospital detachment and can be heard for miles when caroled by Sgt. King, who is strictly "hep to the jive" and around these parts can cause quite a commotion by breaking into his barnyard strut. As a matter of fact, all pilots who find themselves over this are when it's his night to howl immediately go off the beam and, upon landing, lodge a protest against this sabotaging of the airways. We've only been here a short time and now can get our laundry done by the dhobies . . on credit. This, as you know, is no mean feat in itself. Of course, we are sometimes treated to the awesome spectacle of our laundry men strolling down the company street, resplendent in G.I. shorts and tops while the sun beats down upon a medical towel turban. The real payoff is beer night. Most of you, I know, have indulged in a little brew lifting . . now and then. We usually pick the Day Room as our scene of fun and frolic. Our genial Red Cross lady, Miss McGeough, starts the morning of this auspicious day with a little prayer and then proceeds to gather up cigarettes, cookies and numerous other things that tickle the palates of the boys. About 1:30 p.m. our first soldier, Sgt. Gutierrez, opens the PX and the rush is on. We use the turnstile method up here now, because on the initial day of beer ration Cpl. Blagg and Pfc. Williams came through the line in a style highly reminiscent of Knute Rockney's Four Horsemen. This left the other boys stunned and highly indignant. Of course, even now the turnstile method leaves much to be desired. Last month we found one of our men walking around in a dazed condition - his beer money in one hand and part of the turnstile in the other. We found out later that he had been the first one in line. All he remembered was the opening of the PX window. About an hour after chow, we all file toward the Day Room, our brew clutched to our chests and our vocal chords twanging with anticipation. S/Sgt. Sagan, accompanied by Sgt./Major Smith, starts the evening's festivities with a medicine show. Soon the Hep Cats start in and, brothers, from then on until midnight . . the jernt is jumpin'. The next morning at reveille, the men go into something that closely resembles a Conga line. Several get lost, but all invariably agree to a highly successful night before. Another thing that I think should come in for high honors is the medical service that is given to all who have the temerity to pass within our hallowed bashas. The slogan here is: "Let 'em in puny - push 'em out strong." I know of several instances (though this is strictly off the record) where former patients have been giving sick call a whirl every day in an effort to be readmitted to the soothing comfort of our Beauty Rest mattresses and beds. Don't pass up our ambulance service. It is rated as the best in the area. There isn't a hole in Assam that driver Balleau doesn't know. He has a special route for everybody. One is pleasantly called "The Goldbrick Special." While on this route, he drives entirely by instrument. In the middle of the 100th hole, the patient usually screams for mercy. The procedure then entails getting out of the wagon and holding the door open so the patient can escape. From China, S/Sgt. 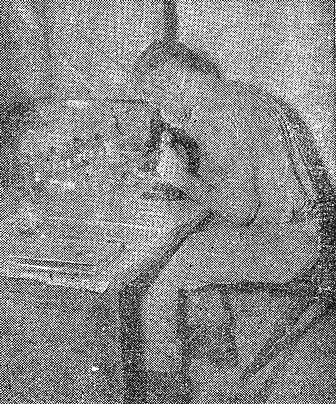 N. J. Taylor employs a torrid typewriter to comment upon the Roundup's "Letters to the Editor" column of July 29, in which a reader described the exquisite torture of trying to light an Indian match. "I don't know if you know this Anonymous (the G.I. who cussed Indian matches), but if you do would you please inform him that Indian matches are considered somewhat of a luxury here . . If he thinks India's matches are faulty, he has never seen faulty ones. I suggest further that he moans to the Chaplain. "I, myself, have one of those boxes of bum Indian matches, but I'm saving them for a special occasion; Like lighting the candles on someone's birthday cake. "I imagine you'll find Anonymous somewhere in Per Diem Hill." I want to stay here 'til its over. I want to stick it 'til we're through. Don't you know we live in clover. Don't you know when bands are playing. Don't you know, with headlines splaying. That we're a most contented crew? Don't you know that war is heaven? Don't you know it's quite a lark? Toss the dice; our number's seven. Your glasses please - the future's dark? A country road; a county fair. Canadian Club, as smooth as silk. But why go on - the die is cast. Why hesitate, or why deceive? We want no interim reprieve. You can read it in the papers. See gangplank movies for mufti gapers. Read the feature eriter's capers. He'll tell you what we all believe. *Inspired by a recent letter written by two Assam G.I. 's and published in the Roundup. It was as good as in his dish. They sprawl upon the sand. "Before we two shall dine." If the damn things wore a muzzle. Until the glittering moon came out. That you shall ever see." Unless I bring my meal. And your bank book makes interesting reading. Plus the fact that you have an honest face. I'll say Maybe, or may be smilingly mute. 'Til I've seen you, my G(overnment) I(ssue). In a twenty-two fifty civilian suit. - By Lt. ELIZABETH SHAUNTY, A.N.C. CENTRAL INDIA AIR DEPOT - Judging by reports flowing in via the grapevine and other reliable sources from up-country stations, American beer actually has arrived in this Theater, and the rumors that this Air Depot will soon be rationed some of the nasty stuff must perforce be accepted as true. The more skeptical, however, won't believe it until they surround the cans with hands unaccustomed to such luxuries and surround the contents of said cans with other parts of their anatomies equally unused to such goings-on. This writer recently returned from a Rest Camp, where the change from the ordinary drab existence of a G.I. was a great relief. Included in the entertainment offered, besides the opportunities for tennis, horseback riding, etc., was a dance jointly sponsored by the American Red Cross and the British Women's Volunteer Service. This was noteworthy in that it was the first dance any of the men had attended since arrival in this Theater at which all of their dancing partners were white. The men gallantly bore up under this and the likewise usual fact that the women were outnumbered by only 80-60. It was a red-letter day for diaries. EAST INDIA REST CAMP - Out of the steaming jungles of northeastern Assam to the cool mountainous heights of this rest camp came tall, tanned T/Sgt. William L. Boarman. From the opposite direction came another man, equally deserving of the forthcoming few weeks of rest after an arduous year of missionary work in the heat of Bengal. He wore the white cloak of the Holy Cross Fathers of Notre Dame, Ind. One full week passed before the missionaries heard of the American rest camp and came inquiring about names and home towns of the soldiers. Upon finding Sgt. Boarman, they told him news which incited him to hail a taxi and speed toward the missionaries' summer rest home. There on the porch the two men met. It had been six years since older brother Rev. Leon Boarman left the United States and family at Owensboro, Ky., to come to India. Christmas was the last he had heard from Bill. The following hours were spent in conversation regarding home. 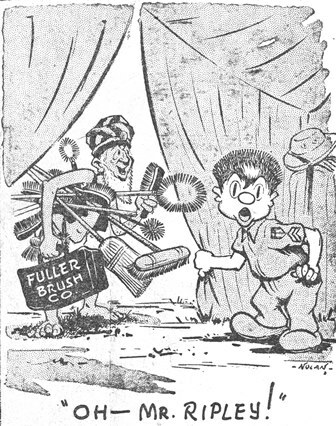 Questions were fired by the white-garbed brother in his Bengali-acquired accent and answered in the slow Kentucky drawl of khaki-clad brother Bill. CHINA AIR BASE - When bombers and fighters rolled noisily through clouds of dust and heaved themselves heavily skyward today, a small group of dusty, sweaty men with day-old beards wiped their greasy hands on their stained overalls and flopped down beside me, relieved. They commented on each takeoff and listened studiously to every motor as the planes groaned downfield; and now they could rest until the planes returned from the raid on enemy territory. Under the layer of dust covering these tough-looking men are American kids who used to putter with Model T's in American backyards. Now they're the men who Maj. Gen. Claire L. Chennault expects to keep his bombers and fighters in the air - and do. Sprawled out on the ground around me this morning the following groundmen discussed problems of Keeping 'em Flying in China: Sgt. Joseph Stanovich, line chief; Sgts. Edgar Lane, James M. Green, Solomon Goodman, Richard Lee, William Barowsky, Bob T. Smith, Thomas Berkey, Thomas Fish, all of fighter crews. Men crewing the hard-worked B-25 squadron under Line Chief M/Sgt. Charles Braddham are Sgts. James Abbot, Charles Mohr, Carlton Hutson, Wayne Currell, Victor Meek, Alvin Schmolt and Richard Matthews. At their home base in China, the bomber and fighter squadrons to which these men belong are fully staffed, but at this advance base instead of five men for each bomber, there are five for many times that number. Fighter crews are much in the same predicament. Today, for instance, Braddham - slim redhead in drooping coveralls - and his men had to change a B-25 tire in 15 minutes in order for the plane to make the bombing mission. B-25 pilots and crewmen have to help the ground crews bomb up their planes, due to shortage of men. Braddham said, "It's rough when we have only got a Chinese screwjack and screwdriver. The best part of our job is when they all get off and we can hit the sack. We don't often get that, though. There's almost always one left behind." 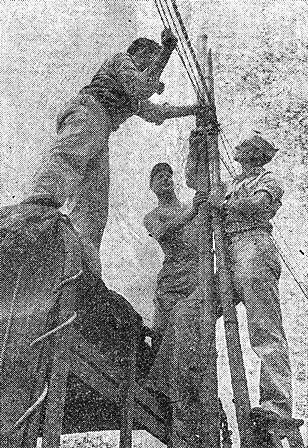 Crewmen must follow their planes from base to base, and Chennault's planes move constantly to keep the Japs guessing. Most crewmen have travelled thousands of miles and have worked in almost every base in China, moving either in B-25's or aboard Douglas transports, sometimes with a notice they are to stay a week and later finding out they are staying a month. GIVEN BY STILWELL The Roundup got its brightest green light to date the other day when Lt. Gen. Joseph W. Stilwell made public his policy with regard to this publication. "The Roundup has been criticized recently on the ground that some of its articles are prejudicial to discipline. I feel the Roundup is a safety valve in this theater and we need one. "Consequently, I had a talk with the editors and the paper's policy of criticism will continue as in the past within the bounds of good sense. So, expect to take a criticism once in a while if you've got one coming." repaired, when at these outposts the men must improvise much of the time. Stanovich said the toughest job he had was when a fighter pilot "chewed the wings off his P-40. We found an old AVG wing and put that on. The ship flew six months until it finally was sent to the base for repairs." Recently when fighters strafed Japanese troops on the Ichang front, almost every American plane returned with at least one hole in it, some with 10 or more. Ideally, sheet metal men would patch the planes permanently, but in an emergency Stanovich said the holes were covered with fabric and "dope" and sometimes fly thus for two or three months before a permanent job can be done; illustrating the job the fighters were expected to do in this part of the world. 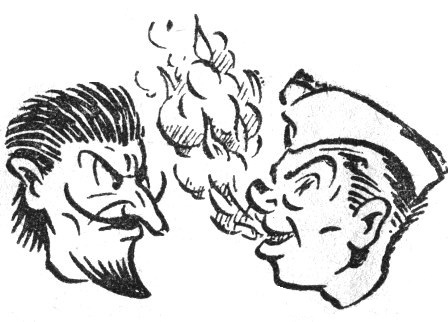 AIR TRANSPORT BASE IN INDIA - Fire-eating Pvt. C. W. Mowry, a professional in vaudeville who has been featured on the "Believe It or Not" program, found his act virtually stolen by a volunteer from the audience, Pvt. Harold James, of Austin, Tex., when G.I. 's presented a typical American variety show one evening recently. Performer Mowry, in addition to consuming flames, had offered various other tricks, including a torture number with long needles, when James came forward, to eat not only fire, but a few razor blades for good measure, much to the delight of khaki-clads witnessing the show. Built around use of the Red Cross Clubmobile, complete with its P.A. system, piano and record player, the performance was emceed by Pvt. George Davis, of Brooklyn, N.Y., whose start as a master of ceremonies was made on the boat coming over. To round out the evening, "back home" guitar-and-vocal numbers came from Pvt. Robert McCullum, of San Antonio, Tex., once a member of a family orchestra with his six brothers and sisters, while a Cleveland opera singer, Cpl. John R. Newman, former student at the Julliard School of Music, added several classical numbers in his rich tenor. Community singing around the mike, plus coffee and doughnuts served by the Red Cross gal, kept the entertainment for Air Transport Command personnel going on far into the night. The program was arranged by Maj. Harold L. Townsend, Syracuse, N.Y., and Lt. B. H. Hawks, Bennington, Vt., commanding officer and special services officer respectively. Capts. William C. Mooney, Robert T. Ulichny; Lts. Carl F. Krohn, Granvill B. Stringfellow, John R. Amann, Loyal G. Brown, Charles D. Brewer, Wilbur O. Marcus, Alex J. Porter, Edison C. Weatherly, Earl C. Bishop, Vernon Ellifritz, Kenimer O. Camp, Stanley J. Hood, Edward K. Hutchinson, Hugh P. MacPherson, Robert L. McIntosh, Arthur F. Warden; T/Sgts. Homer W. Alford, Rolland D. Guffin, Walter J. Carlson; S/Sgts. J. C. Akey, Emerson W. Hurd, George H. Marshall, Leonard C. Reynolds, Stanley W. Schmiett, Henry T. Spiek, Robert W. Witte. Capt. Raymond J. Disher; Lts. Robert V. Bitney, Fletcher F. Taylor, Jr., Ernest E. Lindley; M/Sgt. Wayne L. Covert; T/Sgt. Lawrence L. Phipps; S/Sgts. Roy W. Bullington, Peter Lanchak. Lts. William F. Bryson, Robert C. Lloyd, Russell E. Codington, Ben L. Graves, Neal R. McMahon, Nathan Scolnick, Virgil E. Sellers, Frederick P. Stein, Nicholas P. Wagner; F/O Joseph P. Kelly; T/Sgts. George F. Geyer, Jr., Walter T. Mack; S/Sgts. Glenn E. Brady, Martin P. Flanagan, Robery I. Lamay, Taylor L. Lane, Daniel N. Sbarra, Everett J. Malick. ACTION AT INDIAN PORT BASE G.I. 'S PLACE THIRD IN MEET This action photo of a sprint event taken by T/3 Walter J. Tanner was part of the Inter-Allied track and field meet held recently at an Indian port base. Rusty U.S. forces, entering with only two weeks of practice, surprised themselves by taking third place in an 11-team field. M/Sgt. Roer and T/4 Dunlee performed in the shot put for the first time ever and placed second. Pvt. Cox, of the Air Corps, was a last-minute volunteer and missed individual first place in the hop, skip and jump by a matter of three inches as he and Pvt. Kantor combined to finish second. After tosses which were disqualified, M/Sgt. Atkinson and Pfc. Jordan placed first in the discus. S/Sgt. Bagless and Kantor won the high jump and broad jump. Shortness of wind in the sprints and lack of entries in the two-mile cut into the U.S. total. VETERAN SAYS GOODBYE From Lt. Alex Porter of the Bombing Eagle Squadron, regular Roundup contributor, comes the above picture giving a "send off" to Lt. Jules X. Junker, en route home after 14 months of combat service in the Theater. Junker arrived in India on May 23, 1942, as a member of one of the first crews to complete the pioneering flight from the States, made several reconnaissance flights over Rangoon, flew possibly the "longest medium flight of the war" when he participated in a flight of over 1,500 miles in seven and a half hours and took part in Burma raids for a total of over 300 combat hours. 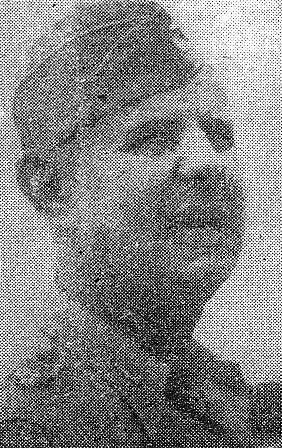 He has received the DFC, Air Medal cluster and Air Medal and has been recommended for a DFC cluster and a second Air Medal cluster. In the above picture, Junker is seen with several of the men with whom he came from the States: Left to right, Capt. 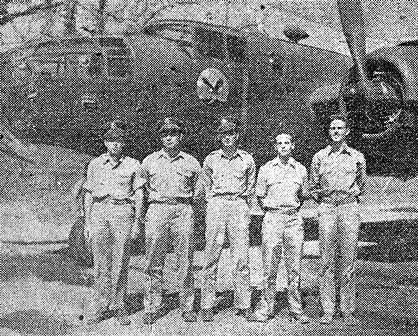 G. H. Berg, Lt. W. C. Amelunke, Lt. Jack J. Jordan, Junker, and T/Sgt. Carl A. Christianson. CENTRAL INDIA AIRFIELD - On these dusky, sun-scorched plains in a land strange to the check pilots and cadets alike, American Army instructors today were selecting the cream of China's potential combat pilots to be sent on to the famous Thunderbird Training School in Phoenix, Ariz. The Americans quickly developed a keen comradeship with their Chinese students and find them apt pupils. Lt. David Burleson, 23, Fayetteville, Ark., who has been checking the progress of the Chinese lads for four months, said, "It doesn't take them long to get the feel of the airplane - and they progress quite rapidly." Burleson cited graduation figures for the first three-month class which ended recently. "We passed half of them - 51 percent to be exact," he said. "That's pretty typical of our averages at home." 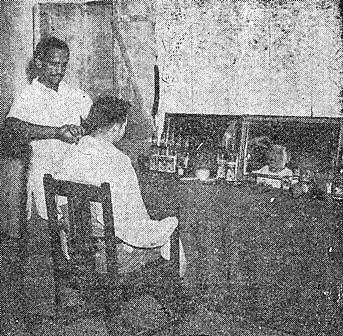 This new scheme of giving airmen candidates primary training in India was designed to save the expense of transporting to the United States many cadets who, in the normal course of training, eventually would be "washed out." The Americans figure those they pass have an excellent chance of getting through advanced training in Arizona, especially since their primary training is repeated there. These cadets come from all over China. I talked to youngsters from Peiping, Foochow, Shanghai, Canton, Changtu. Some interrupted college courses to volunteer, others have spent years in the Infantry, still others walked out of Japanese-held territory. They are the pick of China's youth. here they are trained by Chinese officer instructors, more than half of whom learned their flying in America. Training is modeled on American lines, with typical ground school courses in the theory of flight, mechanics, radio. And they are learning English in anticipation of their American days. The cadets are a highly disciplined group, marching to the field, to classes and to meals with a precision that would do credit to West Pointers on parade. While I ate with their officers in the general mess hall, I watched cadets eating their Chinese "chow," erect as admirals on the bridge, talking only in whispers. China intends that they shall become first class officers. They even used knives and forks instead of their customary chop-sticks, in practice for the vicissitudes of American life. The American check pilots are impressed by their discipline. "These chaps follow our instructions to the letter; their discipline is 'tops'," Capt. Joseph K. Riston, 24, Hope, Ark., veteran of China aerial warfare with one Japanese bomber to his credit, told me. ROLLED UP THEIR SLEEVES AND THEN SOME Cpl. 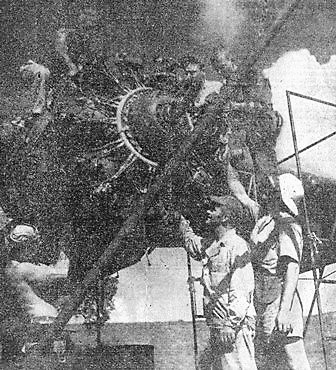 Lee Kruska tells how a ground crew at an Assam air base performed a complete engine change in a B-25 in 13 actual working hours. In this picture, taken by Sgt. Lee Johnston, are some of the enlisted men who worked on the Mitchell: Top, left to right, Sgt. Gasper Reyes and Cpls. Harry A. Briscoe and John R. Sheldon; on ground, S/Sgt. Raymond G. Pryor, Sgt. Charles N. Davis and T/Sgt. Victor Blaine. ASSAM AIR BASE - Whatever else might be said of T/Sgt. Victor Blaine and his crew, they cannot be accused of being unaware that there's a war going on. The lads have just set some sort of record (perhaps a new one for this Theater) by performing a complete engine change in a B-25 medium bomber in 13 actual working hours. No one was more amazed at the speed of the job than Maj. Robert D. McCarten, commanding officer, because he scoffed at their claims. In fact, so positive was the CO that it couldn't be done that he rashly promised to buy every member of the crew a drink if they could make good their boast. Came next evening and the major piled into his jeep and sped out to the line with the intention of seeing how the job was progressing and possibly to hand out a little razzing. To his amazement, there stood the ship, ready for the test trial. The "boss man" wheeled the ship out himself, took a spin, then pronounced the installation perfect. "I think you men have set some sort of record for a speedy engine change," he lauded, adding that it was all the more remarkable inasmuch as the job was done in the field and included overhauling all old accessories and installing them on the new engine, plus giving the valves a check. Members of Blaine's "speed merchants" were S/Sgts. John P. O'Rourke, Raymond G. Pryor, John P. Gray and A. L. Allen, Sgts. Gasper Reyes and Charles N. Davis, Cpls. Harry A. Briscoe and John R. Sheldon and Pfcs. Chester R. Bishop, Gordon B. (Slim) Murphy and Harold T. Bock. 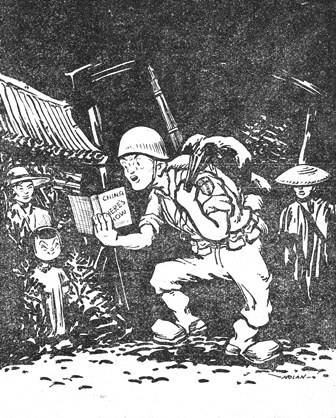 Wiry, whip-smart John Davies, Jr., who added another exciting page to his decade of experiences in the Far East by parachuting to safety from a transport plane last week, is responsible for the meaty 63-page booklet, Here's How, now in the hands of American troops in China. This is the first time the Roundup has presumed to cast itself in the role of literary critic, but the book merits a plug in the Theater newspaper. Davies, the State Department's liaison officer with Lt. Gen. Joseph W. Stilwell, knows China and the Chinese intimately. His book is slanted at the newcomer, a stranger in a strange land. "In this new setting," Davies explains, "you have two courses open to you. You can try to dismiss the whole problem of China and the Chinese with a generalization - which will probably be false - and then spend your spare time wishing you were with a blonde in San Antonio or Brooklyn . . . A second course is to approach your new environment as you would approach a new piece of machinery or a new sales technique - how does it function and why? The author works on this latter approach and accomplishes his mission with eclat. In simple words, he makes practical working suggestions on how to "get along" in China. Among a wealth of other material, he explains the meaning of "face," advances tips on the entertainment, eating and drinking situations; outlines the Chinese way of life, which is geared to a more leisurely tempo than our own; includes a chapter on etiquette entitled "The Soldiers' Emily Post;" enlarges upon "squeeze;" and, somewhat charmingly, we think, describes a Chinese street argument headlined "All Holds Barred - or - Chinese Marquis of Queensbury." Part II of the Davies book is heavier going - but good. He presents a thumbnail sketch of Chinese background - family life, religion, politics, etc. - that is also a "must." The great majority of G.I. 's have enough natural curiosity to make them want to find out about the Chinese, what their point of view is, what customs and manners they have that we should know about if we want to avoid offense and make a good impression and, finally, how they came to that point of view and custom. Here's How in 63 pages, is an introduction to the answers of many tricky questions. As Davies observes, "You will have to fill in the final answers as a result of your own observations, other reading and conversations."